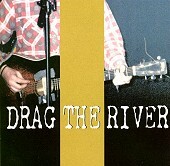 A beautiful country album from the label ran by Karl Alvarez and Bill Stephenson (All, Descendents fame), Drag The River's Closed is at first shocking. When it settles in, though, the record is pure brilliance. A whiskey-drenched, stinging country album filled with acoustic, crying-in-my-beer laments, rockin' songs that make you get up off the bar stool and move around, and sweet, slide-guitar fueled alt-country mayhem. This is country at its finest, on par with the greatest country musicians like Willie Nelson and the man himself, Hank Williams. Forget the Nashville pop pretenders like Garth Brooks, this is country as it was meant to be played - soulful, honest, and void of any commercial high hopes. Here are real emotions put into real songs sang by the man who has lived through it. I'll give this an A.